But is it as strong as it looks? Chinese Hearthstone streamer TaoMei unveiled a brand new legendary Warlock card in the early hours of the morning, and it has tons of potential. Fel Lord Betrug, originally from the Violet Hold in World of Warcraft, is a hefty eight-mana, five-attack, and seven-health demon. Whenever you draw a minion when the card is in play, you’ll summon a copy of it with Rush. The minion will die at the end of the turn, however. Fel Lord Betrug has quite a high mana cost and his health pool isn’t ideal, but he could lead to some interesting situations. If you’re in the later stages of the game, and you have 10-mana in the bank, you can play Fel Lord Betrug, immediately Lifetap, and draw a card with Rush. 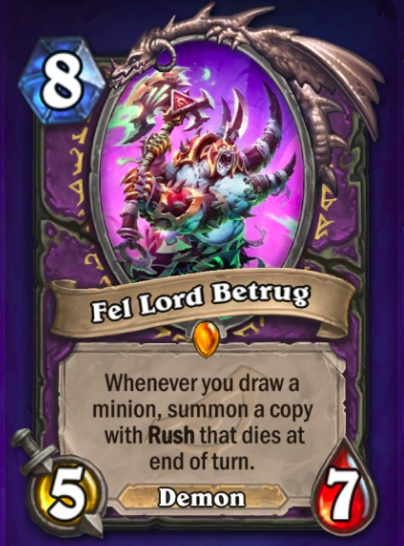 Fel Lord Betrug looks like a combo card. He has the potential to deal a great deal of damage—but that’s never going to be easy. The card requires a well thought-out deck, and one that synergies with low-mana minions. In a video clip showcased on TaoMei’s stream, the Warlock played Fel Lord Betrug, Life Tapped, and drew Dr. Morrigan. They attacked Lord of the Arena, activated her Deathrattle, then pulled out Leeroy Jenkins for the kill. 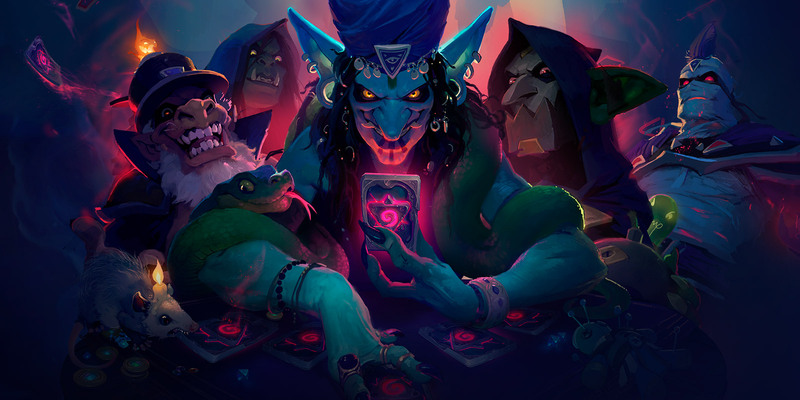 You can get your hands on all of the cards from Hearthstone’s Rise of Shadows expansion when it releases on April 9.